Be the first to share your favorite memory, photo or story of Gay. This memorial page is dedicated for family, friends and future generations to celebrate the life of their loved one. 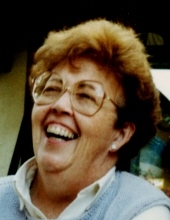 Gay Murphy of Lewistown died April 5, 2019 at the Central Montana Medical Center, surrounded by her family. She was 85. Born Teresa Gay Stainhofer in Lewistown, her father died when she was an infant, and she spent her early years in Lewistown where she, her mother Betty, aunts, and grandparents weathered the early years of the Great Depression sharing a single household. When Betty remarried, she moved to the Winifred ranch of stepfather Robert Heggem and helped raise five new siblings: Mary Ellen, Dar, Robin, Jack, and Ed. Mary Ellen remembers she was, "... a wonderful big sister. Her wisdom and strength were unmatched." Gay graduated from Winifred High School in 1951. She went on to the Columbus School of Nursing in Great Falls and became a Registered Nurse. She married John Murphy, her high school sweetheart, at St. Leo's Church in Lewistown on her 21st birthday in 1954. Gay is survived by her husband, John of Lewistown; their four children: son, Scott of Denver, CO, and daughters, Kelly of Louisville, CO and Teresa of Boulder, CO; and Kerry of Hong Kong; five grandchildren: Zach of Steamboat Springs, CO, Aaron and wife Sharon of Aurora, CO, Kayla and husband Sean of Beirut, Lebanon, Kate of Denver, CO, and Rebecca of Washington D.C.; sisters, Mary Ellen Johnson of Great Falls, MT, and Robin Ericson of Helena, MT; and brothers, Dar Heggem of Mitchell, NE, and Ed Heggem of Winifred, MT. Gay started her family with John in Lewistown, and all four children were born at the old St. Joseph's Hospital there. John's work took the family to Billings and eventually to Denver. Gay practiced nursing in Montana and used her background in caring for others to move on to work in social services in Denver. She proudly maintained her nursing license and cherished lifelong friendships with Flossie Kettering, Kathleen Woodward, and other nursing school classmates. Gay and John lived in the Denver suburb of Arvada for more than 30 years. There she served as a Room Mother in her children's elementary school, a Girl Scout leader, and volunteered in the community in addition to her professional employment in mental health and at the United Way. Her rose garden in their Arvada back yard was a source of joy for years and became the favorite haunt of their rescued cat, Tiffany. Upon John's retirement, they sold their home in Arvada and joined the world of RV'ers. They divided their time between winters in Casa Grande and Yuma, Arizona, and summers in Lewistown. Gay's gift for home-making made their RVs warm and welcoming. That and her genuine interest in others won many new friends for her and John in Arizona. Their deep roots in Montana and Gay's desire not just to be a nomad, led them to buy a condominium in Fountain Terrace, once St. Joseph’s Hospital. The condo's sunroom windows look out on the Judith Mountains and on the old maternity wing where her children were born. In recent years, they lived year-round in Lewistown. Gay was a lifelong learner and avid reader and nurtured these enthusiasms in her children. In later years, macular degeneration robbed her of most of her sight, but she carried on reading with the help of the Montana Talking Book Library and became fast friends with her librarian there. Friends and family will remember her for her kindness, wisdom, and support in times of need. In lieu of flowers, please consider a donation in memory of Gay Murphy to the Medical Center Foundation General Fund, c/o Central Montana Foundation, 408 Wendell St., Lewistown, MT 59457. A Memorial Service for Gay will be held at 2:00 p.m. in the Winifred Community Center on Wednesday, April 10, 2019. Inurnment will follow at the Winifred Cemetery. To send flowers or a remembrance gift to the family of Gay S. Murphy, please visit our Tribute Store. "Email Address" would like to share the life celebration of Gay S. Murphy. Click on the "link" to go to share a favorite memory or leave a condolence message for the family.